Microsoft Office Word may be the most important member of the MS Office family. It is used extensively for creating multiple types of documents. These documents may be reports, newsletters, blogs, prescriptions, receipts, resumes, technical papers, etc. So, what will happen if an important document is accidentally deleted or corrupted. It can be quite catastrophic for businesses which heavily rely on Word documents to generate reports, letters, and financial records. Here are some scenarios which depict various problems related to MS word file inaccessibility. I am a final year law student and I have to routinely write various case studies of multiple cases and submit to my professor. These case studies take too much time to complete and I always save them on one of my desktop folders. But today, when I opened the computer, the folder was not there. Now, I will have to work on those case studies again which will require at least a month – Peter. Being a professional blogger, I always need MS word to complete my blog and publish it for my clients. I was working on a series of blogs and was saving them at the same place. But due to corruption on my PC, none of these blogs are opening. It is a real waste of my time and energy as I will not be able to complete my client's assignment on time. Check the recycle bin: It is the most natural reaction whenever a file is accidentally deleted. An operating system does not delete the file at once but stores it in the recycle bin. And the file gets permanently deleted when the user empties recycle bin. So, a recently deleted file can be easily recovered from the recycle bin. Recover from backups: If the backup is enabled for MS Word, then a deleted word file can be recovered from its backup. The backup file is generally saved with .wbk extension in the specified folder with the name ‘Backup copy of . You can find this file and save it. Recover from temporary files: Temporary files are saved in the Local settings folder in C drive with .tmp extension. While searching, make sure that you can see the hidden files or folders. 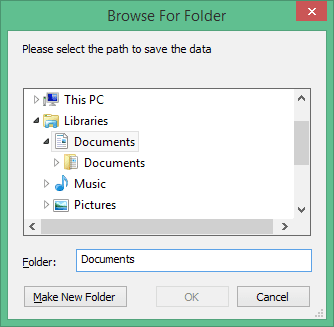 In the temporary folders, search for the required file and copy it back to its actual location. 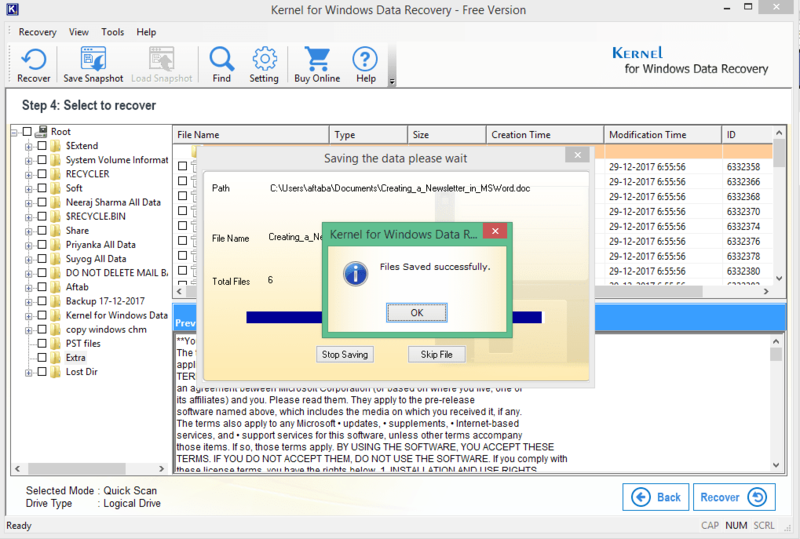 Kernel for Windows Data Recovery Free Version scans the logical and physical drives of the system and recovers all data including the deleted items. It works in three different modes Quick Scan, Deep Scan, and File Trace. 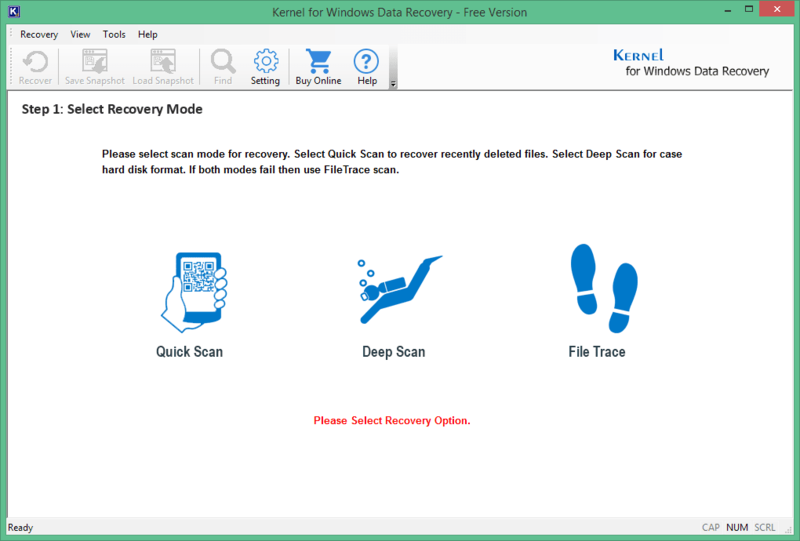 Quick scan: It is the fastest scan which quickly recovers recently deleted files. It can be used in case of file corruption, the presence of bad sectors, and index corruption. Deep scan: It should be used when quick scan fails to recover the data. File trace: It is the most efficient scanning method. 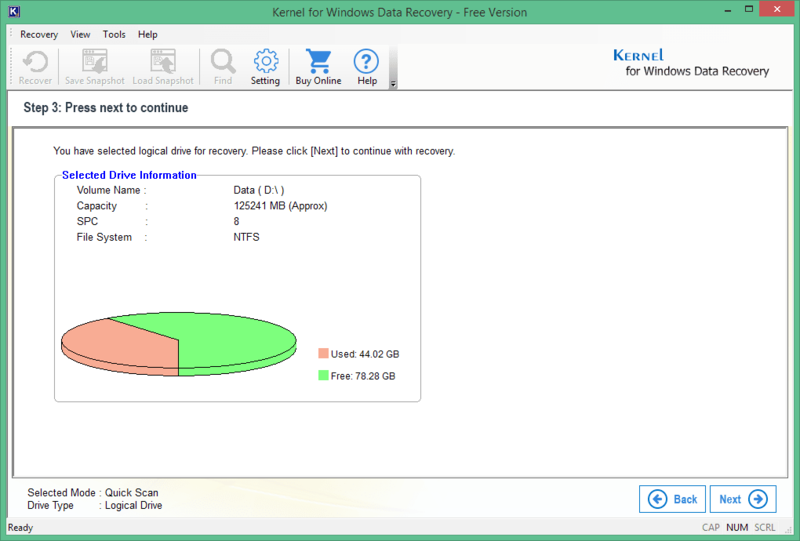 Though slow, it searches each sector to recover the maximum data. The user interface of the tool is also quite simple. It presents all three scanning modes on its home screen. Click on any scan mode. The next window will let you choose the logical drive or physical drive. Never choose the drive where the software is installed. Click Next. The third window will inform you about the option you have chosen, the used space, and the free space. Click Next. 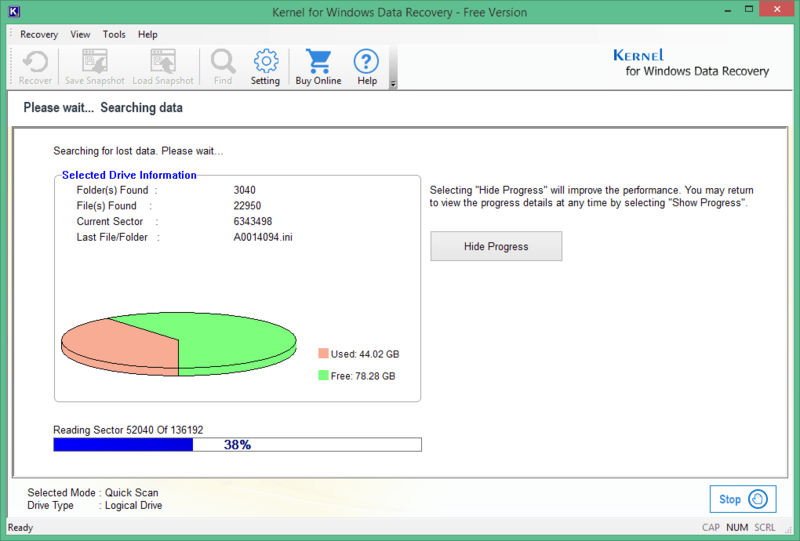 The tool starts recovering the data. You can choose to either stop it or hide the progress bar. As soon as the scanning finishes, the tool arranges the recovered data in a structured tree-format. You can click on any file and see its preview. To recover the data click Recover icon. Select the folder where you want to save the data. Finally, you will get File saved successfully message. Click OK to finish the process. 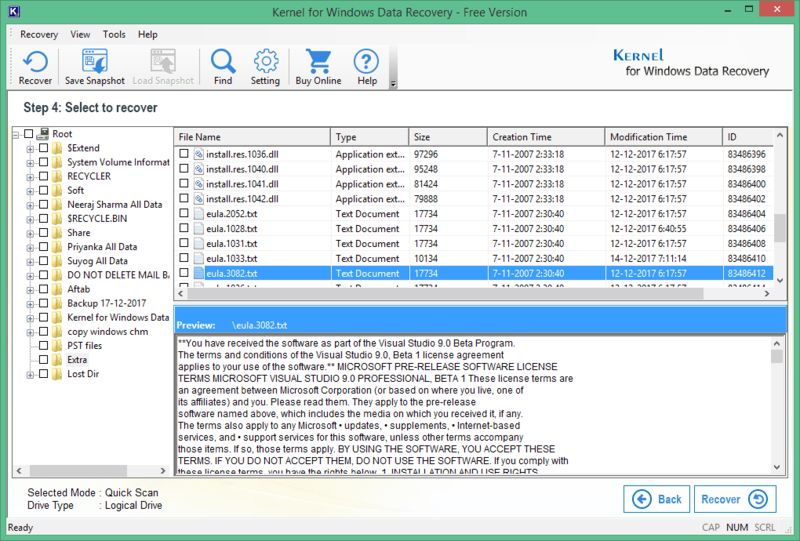 Kernel for Windows Data Recovery Free Version is a unique tool specially designed to recover every type of data (audio, video, documents, etc.) saved on the computer. 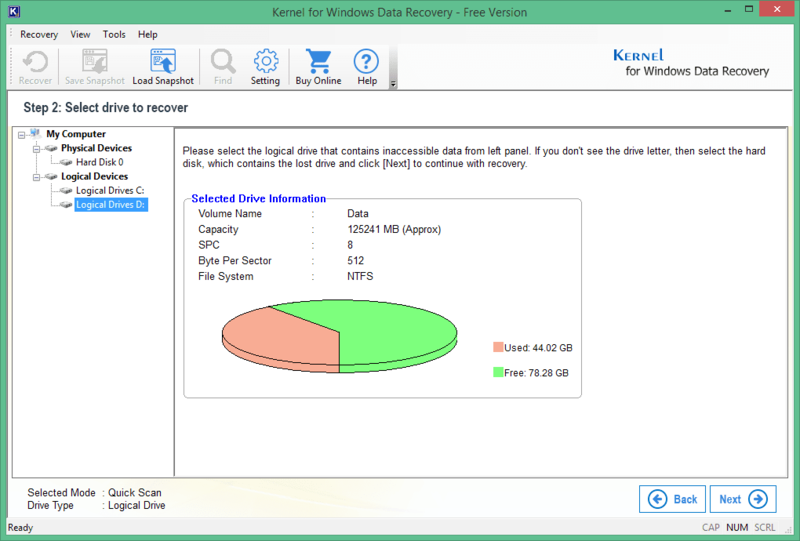 A user can freely recover data up to 2 GB. To recover more, a licensed version is required. It is far better to use Free Data Recovery rather than using any manual method as it has much more advanced scan options which can bring back even the deleted data.